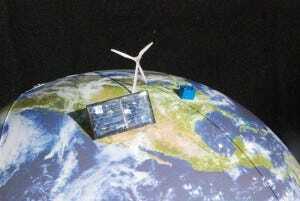 World Congress on Ecological Sustainability: drag2share: Who Wins In The Contest Between Wind And Solar? drag2share: Who Wins In The Contest Between Wind And Solar? For me, the most delightful turn of events in the ultimate nerd-song “Particle Man” by They Might Be Giants, is that after introducing (in order of complexity) particle-man, triangle-man, universe-man, and person-man—and learning that triangle-man naturally beats particle-man in a match up—we pit person-man against triangle-man to discover that triangle wins—again. In this post, we’ll pit solar against wind and see who wins. I will take my usual approach and estimate what I can—as opposed to researching the results of detailed studies. It’s part of the process of personal mastery of the big-picture issues, while also providing a sanity-check. In exploring useful reactions to the looming peak oil crisis (or pick your favorite rationale for weaning ourselves from fossil fuels), an appropriate strategy is to assess ballpark capacities of the various options. Some will prove to be orders-of-magnitude more prodigious than we need, others will be marginal, and many will show themselves to be woefully inadequate to match the required scale. So the goal is to perform this crude sorting process into abundant, useful, and waste of time. Since many of the options I will discuss in the coming weeks ultimately derive from the Sun, it is useful to throw up an energy budget. Of the 1370 W/m² incident on the upper atmosphere from the Sun, 30% is reflected straight away without pausing long enough to say hello. About 20% is absorbed in the atmosphere and clouds, and 50% gets absorbed at ground level. 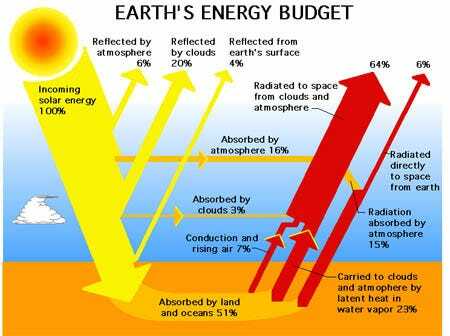 Note that 7% of the energy budget goes into conduction and rising air (separate phenomena; the latter relating to wind). Virtually no heat is able to conduct through the thick atmosphere, so really this figure is all about convection, or moving air. For comparison, the energy consumption (conversion) rate of the human race is about 13 TW (13 trillion Watts), which works out to an average of about 2,000 W per person on the globe (Americans are 10 kW). We can also divide by the area of the globe to get a power density of 0.025 W per square meter, or 0.09 W/m² if we just count land area. If 50% of the incoming solar radiation makes its way to the ground, then we have about 700 W/m² for the average terrestrial square meter facing the Sun. But the Sun puts this onto the projected πR² area of the Earth (the disk of the Earth as seen from the Sun), while the actual 3-D globe has an area of 4πR². So we must divide by four to get the flux per unit area of actual terra firma, yielding 170 W/m². We can think of this factor of four as being made up of a factor of two for day and night, plus a factor of two because the Sun is not overhead all the time, resulting in a loss of intensity per square meter at the ground. A panel tilted to the site latitude can compensate for some of the slanted-sun-angle loss (for high latitudes, the ground always suffers from this geometric dilution, even at “high” noon), so that the ½ factor becomes 2/π, or 0.64, representing a global 30% boost over horizontal panels. In this scheme, we get 220 W/m² for our latitude-tilted panel (nearly independent of latitude, weather notwithstanding). The tilted panels will require more land to avoid self-shadowing, so that the amount of land area needed is stuck with the pre-adjusted value of 170 W/m². Note how much bigger the solar potential is than our demand of 0.09 W/m² of land area. This implies that we need only 0.05% of the land to capture adequate sunlight, or that enough sunlight strikes land (the entire Earth) in 4.5 hours (1.25 hours) to satisfy our needs for a year. That’s a powerful resource! But once we factor in efficiency—say 10% for simplicity and conservatism—we need ten times the land area computed above. Still, it’s a pittance. I have used the following graphic before to illustrate how much land would be occupied by solar photovoltaics (PV) at 8% efficiency to produce 18 TW of electrical output (note that about half of the 13 TW consumption today is lost in heat engines, so 18 TW of electricity more than satisfies our current demand). Figure 2. The land area needed to produce 18 terawatts (50% larger than 2010 value) using 8% efficient photovoltaics, shown as black dots. I’ll put solar in the “abundant” box. Catching energy from the Sun is pretty simple. Sit in the sun on a cool day and benefit from its warmth. Situate your house so that south-facing windows can swallow sunlight and offset (or obviate) conventional sources of heat. Use thermal collectors for domestic hot water and/or interior heating. Stick a PV panel outside and it will generate electricity provided it is not placed face-down. Concentrate sunlight to heat a fluid and/or create steam for electricity production in a heat engine (possibly combined with thermal storage). Lots of options, when the sun shines. Many react to my solar enthusiasm by pointing out that San Diego is an exceptional place for solar—so no wonder I’m enamored. But San Diego is only 19% better than a typical location in the lower-48 states (we get a lot of marine-layer clouds: May Gray is followed by June Gloom, and sometimes July Nebulae—okay, the last rhyme is my own Latin-nerd invention, so groans excused). The National Renewable Energy Lab (NREL) performed a 30-year study of insolation for 239 sites in the U.S. (data here), out of which one can see that the worst study location in the lower-48 (Quillayute, WA on the Olympic Peninsula) is only a factor of two worse than the best study location (Dagget, CA in the Mojave Desert). It turns out that St. Louis, Missouri wins the prize for most typical solar location, based on a variety of measures. It gets an annual average of 4.8 kWh/m²/day (which, conveniently, is equivalent to 4.8 hours of full, direct sun each day, since the full, direct sun delivers approximately 1 kW/m² of power). Divide this number by 24 to get kW/m² for comparison with our previous assessments: 200 W/m² for St. Louis. A table comparing the worst, typical, and best sites in the U.S. provides some useful numbers to chew on. For each location, three modes are considered: flat panel tilted at latitude (typical PV); flat panel with 2-axis tracking of the Sun; and concentration requiring 2-axis tracking and direct sun (e.g., for solar thermal, which is intolerant of clouds). For each mode, three daily-average numbers are given: worst month—yearly average—best month. Values are in kWh/m²/day, and averaged over the 30-year data span. Yearly variation is detailed in the raw data. Think of the numbers as equivalent full-sun hours per day. I threw in San Diego, California and Fairbanks, Alaska for reference. I could devote a whole post to chewing on these results and what they tell us. I won’t, but I can’t help pointing out that Fairbanks—at 65° latitude—is competitive with Quillayute, and on an annual average basis gathers 50% as much energy as the smokin’ California desert! Yes, December is bleak, and seasonal storage is very tough. But still, I’m impressed. Wind represents a secondary solar energy flow, coming from differential solar heating of the land and from convection induced by temperature gradients in the atmosphere (hot below, cool on top). Wind is therefore like solar crumbs on the table and is destined to be a small fraction of the direct solar potential. How much would you guess? 1%, 5%, 10%? What handles might we put on it as an estimate? One approach is to note that convection is a thermal process driven by the temperature difference between the warm surface and the cool heights. The maximum thermodynamic efficiency for producing mechanical energy out of a thermal system (we call this a heat engine) is (Th − Tc)/Th, where subscripts denote the hot and cold limits, expressed in Kelvin. The troposphere—from the ground up to about 10 km, where weather lives—has an average surface temperature of about 290 K and tropopause temperature of about 230 K, leading to a maximum efficiency of 20%. But now we get to chop this down according to the notions that about half of the cooling in the atmosphere is via direct radiation and not convection, that a fraction of the total convective energy will manifest itself in horizontal winds, and that there will also be viscous losses turning the kinetic energy of wind back to heat in the atmosphere. So I end up estimating that less than 5% of the thermal energy deposited by the Sun ends up driving horizontal winds. Another handle we might try is to guess that a typical wind speed in the troposphere is 20 m/s (44 m.p.h. ), and note that each square meter of land has 104 kg sitting on top of it (leading to mg = 105 N/m² of pressure, or 14 pounds per square inch). So the kinetic energy in the air is ½mv² = 2 MJ over each square meter. Now comes the tricky part. If we instantly sapped all that energy from the air, how long would it take to re-establish the full flow as if nothing had happened? I’m going to say one day, or 86,400 seconds. I am simultaneously tempted to go longer and shorter. Neurosis can be the sign of a decent guess. This translates to a power density of about 25 W/m², which is about 7% of total solar input. Not bad for ballpark. Noting that the energy budget graphic above puts rising air at 7% of the total solar budget, we might guess 5% in horizontal winds as an upper bound. This gives 17 W/m², an order of magnitude less than sunlight available at the surface. Ah—but how much of this wind energy is available at the surface? Catching the wind can be a subtle enterprise. Greed is punished. By robbing all the kinetic energy out of an oncoming wind, the air must necessarily stop, so that the oncoming airflow diverts around the obstacle. Theoretically, an isolated windmill could capture 59% of the kinetic energy incident on the rotor area before becoming self-limited (called the Betz limit). Engineering practicalities impose further limitations, so that the best windmills today achieve 40–50% total efficiency. How much power will a windmill generate? If the air velocity is v, each second of time delivers a tube of air with volume Av, where A is the area of the rotor (πD²/4, if D is the rotor diameter). The mass of air incident on the windmill each second is then ρAv, where ρ ≈ 1.2 kg/m³ is the density of air. The kinetic energy available per second, or power, is therefore P = ½ρAv³. Then we’d multiply this by the net efficiency (<50%) to get power delivered. Note the cubic dependence on velocity. This is a big deal. Cut the wind in half and suffer a factor of eight less available power. The largest wind turbines in the world now have a rotor diameter of 126 m and generate up to 7.6 MW (which I calculate corresponds to v = 13 m/s, or 29 m.p.h.). Windmills usually self-limit at higher wind velocities or else risk literally being blown to pieces. Assuming that our windmills could lay claim only to the lower 150 m of the atmosphere, we access 180 kg/m² of air above the ground, which is 1.8% of the total we used to drive our calculations. This turns our 17 W/m² into 0.31 W/m². Factoring in efficiency of collection, I get 0.15 W/m², which is marginally larger than our land-based need. And I must bear in mind that I considered 5% to be an upper-bound estimate of the fraction of solar input energy converted to horizontal wind. And I have not addressed the fact that wind near the surface is lighter than winds aloft. On the other hand, winds are not strictly stratified, so that new energy can enter from above, extending our reach above the 150 m limit I used. On balance, wind certainly goes into the “useful” box. But considering practicalities, wind may not be capable of satisfying our total demand the way solar so easily can, even if deployed across 100% of the land area. Who wins? It depends on what you value most. If it’s installed capacity, wind smokes solar. If it’s total available resource, solar wins hands-down. Economically, wind comes in cheaper per peak Watt or per kWh produced, so it wins this contest. Small scale (home) installations: solar takes it. Night-time: advantage wind. Intermittency: both lose (though often in complementary ways). Figure 3. Annual insolation. Multiply values by 1000 and divide by 24 to get units of W/m². Here, the values are given in kWh/m²/day, so to get W/m², just multiply by 1000 and divide by 24. 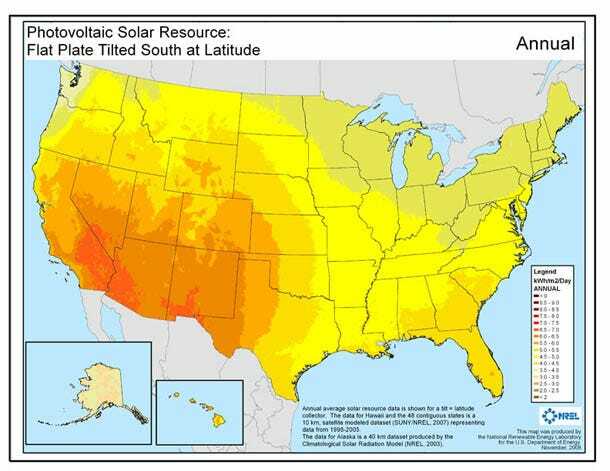 For instance, the bright yellow covering Missouri is 4.5–5.0 kWh/m²/day, or 188–208 W/m². The steps are in increments of 0.5 kWh/m²/day, or about 20 W/m². This puts the most orange regions in the desert southwest at 271 292 W/m². Note that the best sites exceed 800 W/m², and large land areas approach 500 W/m². On the face of it, this looks far better than solar. But beware: the area in the denominator for wind power density is the area of the rotor—not the land area as is effectively the case for the solar map (panel tilt amounts to a 15% boost at 30° latitude, 41% boost at 45°). A rule of thumb for a field of windmills is that they should not be closer than 5 rotor diameters side-by-side (relative to wind direction) and 10 rotor diameters in the wind direction (some use >4 and >7, respectively). Otherwise one windmill blocks the next, bogging down the wind and diverting the flow around the hindrance. The result is that each windmill stakes out a land area 50 square rotor diameters, while the rotor itself is π/4 square rotor diameters. The rotors therefore occupy only 1.6% of the land area, so that the raging 800 W/m² by rotor area becomes 13 W/m² by land area, and the inland hotspots become 8 W/m². The upshot is that a 1 m² patch of flat land in the Texas panhandle might get 200 W of average sunlight (downward corrected for latitude tilt), compared to 8 W of wind power. If we convert sunlight to electricity at 15% efficiency, and wind at 45% efficiency (typical numbers), we have 30 W vs. 3.5 W. Solar beats wind (in that same location) by an order of magnitude. Comparing optimal solar sites to optimal wind sites (taking 1000 W/m² by rotor area), solar wins by a factor of five. As a side exploration, if I look at the wind picture above, and use Lake Michigan as a reference area for water and Nebraska as a typical area for a state (at 60,000 km² and 200,000 km², respectively), I count about 8 lakes’-worth of offshore red, one lake’s-worth of offshore blue, and about 7 more of orange-to pink. Add to this 8 states’-worth of orange-pink on land and we have 13 TW of offshore wind potential and 4.5 TW of land-based potential represented in the graphic (while using 3 TW). My earlier estimate of 0.15 W/m² of wind potential, when multiplied by the area of the lower-48 states gives about 1.2 TW. I am left to puzzle over the disparity. My estimate is capped by the 7% of energy allocated to moving air in the solar energy budget, so either the estimates based on the map are wildly optimistic (e.g., the power density is based on isolated windmills, while full-scale deployment may create enough friction to substantially alter wind patterns; and/or because I did not apply efficiency factors), or my restriction of using the bottom 150 m of atmosphere neglected possible energy replenishment from vertical currents. See the Appendix for comparison to studies and some insight into the mismatch. Solar and Wind have been vying for purchase in the energy game for many years now. Who is winning? Fossil fuels: they still beat the pants off either one. That’s our triangle. Fossil fuels are cheap and reliable and are their own storage and allow transportation by car, truck, ship, airplane, and fit seamlessly into our current infrastructure. Wind—and especially solar—don’t generally compete price-wise. Both are intermittent, so that they won’t fit into our current infrastructure at a large scale, requiring substantial storage and transmission in order to become major providers of energy. Neither one really helps with the liquid fuels crunch we will experience in the oil decline phase. Electric cars are unlikely to penetrate the market quickly and cheaply enough to avert hardship. Don’t get me wrong. I am a huge fan of both forms of energy production—especially solar. I’m swayed by the raw numbers solar has on its side. I have a home-built stand-alone PV system and golf-cart batteries that provides most of my electricity (as a hobby with benefits). I am delighted by the fact that wind now generates about 1% of the electricity in the U.S. for prices that are not terribly greater than for conventional power. I personally think that we should get over our gripes about these things being more expensive than our old friends, and embrace them full-scale—dealing with the costs, intermittency, storage issues, transmission build-up, together with a reduction in our total demand. I know these things are possible, and that we have in the Sun and wind resources that can satisfy our (hopefully reduced) needs from a physical point of view. But the idea that people would voluntarily commit to this more expensive course of action in a timely manner seems to be pure fantasy. Only rising energy costs will drive us. And we risk waiting too late. And we find ourselves in The Energy Trap. And we learn that everything gets more expensive when energy prices soar—even the renewables that are supposed to be the escape route. Our indebted economy and polarized political system crack under the stress. Substitutes do not sweep in to save the day. Person-man meets Energy-man. They have a fight, triangle wins. Triangle-Man. As part of an undergraduate research project, Thomas Tu sifted through credible assessments of wind potential for comparison to my estimations. For context, my endpoint estimate was 0.15 W/m², which translates to about 21 TW if 100% of Earth’s land area were to be developed. We consume about 13 TW globally, and have 0.045 TW of wind power installed. Among the finds was a gem of a paper by Carlos de Castro et al., winning my Most Valuable Paper award for several reasons. First, it summarizes estimates of global wind potential from a variety of sources. Second, it follows a top-down approach much like I did here (starting with the total energy budget available). Third, it points out that many bottom-up estimates (starting with the output of a wind farm and scaling up) violate energy conservation by ending up with more energy than is available in the system. The full PDF is access-restricted, but the basic points are summarized in a post on the Oil Drum. As summarized in the paper, estimates of global potential range from 1 TW to 80 TW. Assessments of economic viability tend to put us at no more than 5 TW by 2050, and the ultimately sustainable wind potential is estimated at about 7 TW. One important thing to note is that estimates vary by a lot—meaning that we are not yet sure whether wind can fill a substantial part of our current demand. What I found especially useful about the de Castro et al. approach was a set of numerical values for the total power dissipated by wind in the troposphere (these numbers range from 340–3600 TW, again covering a wide range). They pick 1200 TW as the most physically realistic. 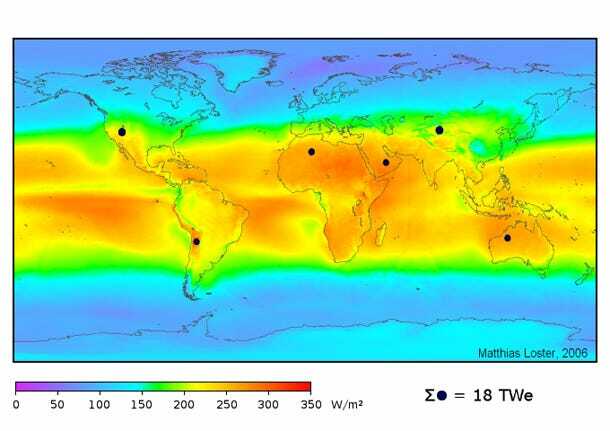 The next step is to estimate how much energy is available in the lowest 200 m, which they approach by three independent methods, all pointing to about 100 TW. Note that this is about four times larger than the strict proportional amount (200 m out of 10 km would yield 2% of 1200 TW, or 24 TW). So in effect, this contains the energy replenishment I suspected I missed: dissipation of wind energy takes place disproportionately near the ground. Applied to usable land (avoid ice sheets, etc. ), we have 20 TW available worldwide. They proceed to apply various practical efficiency constraints—many of which I left out of my analysis. These factors are summarized in the Oil Drum article—ending up with an estimate for global potential of about 1 TW. Even if this estimate is an order-of-magnitude too pessimistic (though I resonate with their top-down common-sense approach), the result is the same: wind deserves a place in the “useful” box, but it does not have the numbers behind it to make it an over-abundant resource like the Sun.